Contemporary religious and theological scholarship is acutely aware that different contexts result in different ways of thinking and speaking about God. This article situates God-talk intentionally in the present global and post-secular horizon and asks about the implications of this hermeneutical move. 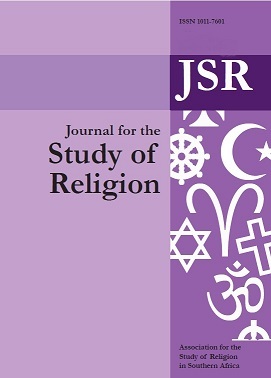 Mapping scholarly trends in this regard is a specific aim of the article, which is written from the perspective of Systematic Theology in conversation with the Study of Religion. The development of reflection on God in inter-religious theologies and in the so-called Trinitarian rediscovery is discussed. Two academic challenges are identified as part of a constructive proposal – a re-envisioning of the relationship between the Study of Religion on the one hand and Christian Theology and Systematic Theology respectively on the other at public universities. Possible future constructive avenues are suggested and the article proposes a minimalist way forward to engage the global and post-secular context, and highlighting an inter-subjective ethos, attention to discursive performances and the African context. JSR holds the copyright of all publications in JSR. If an author wishes to re-publish a published article, book review or any other communication that has appeared in JSR, or part thereof, a request to this effect must be submitted to the Editor-in-Chief. All such requests will be approved within reason. If an outside publisher wishes to re-publish a published article, book review or any other communication that has appeared in JSR, or part thereof, a request to this effect must be similarly submitted to the Editor-in-Chief. All such requests will be approved within reason. No part of a publication in JSR may be reproduced, stored in a retrieval system, or transmitted in any form or by any means electronic, mechanical, photocopying, recording or otherwise, without the prior permission of the copyright holder and publisher.